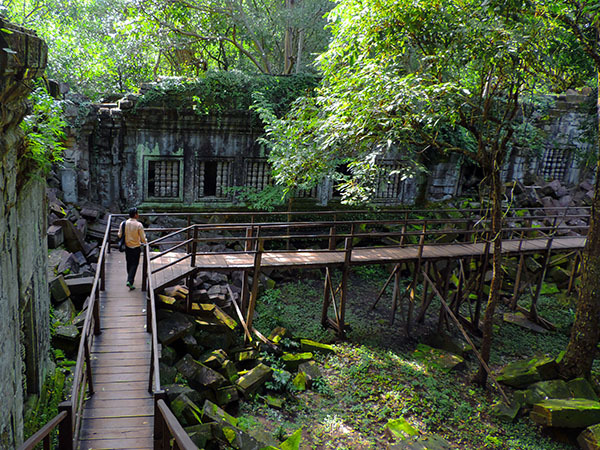 I always wanted to visit Angkor, the archaeological treasure house in the jungles of Cambodia. Now I had my chance. En route to Singapore from Vietnam, I took a side trip from Saigon to Siem Reap, the Cambodian city that’s the gateway to Angkor. The morning following my arrival, my guide, Sarevy, along with our driver Serei, picked me up at the Meridian Hotel at the ungodly hour of 4:40 AM. 15 minutes later, in the ticket line at the entrance to Angkor, I thought we should have come even earlier. Our wait, however, wasn’t too long, and soon we were inside the park awaiting the sunrise with a thousand others. Sunrise in Asia always seems brilliant to me. It’s even more so when viewed in front of intricately carved temple towers silhouetted against the sky. Angkor is the capital of the ancient and great Khmer Empire. The most significant archaeological site in all of Asia, it’s in an area of hot, dense jungle in northwestern Cambodia. 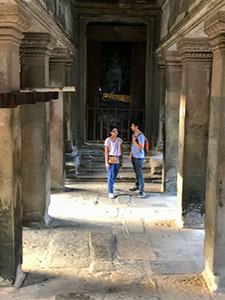 It was the ancient capital of Cambodia from A.D. 802-1431 and the heart — both politically and religiously — of the Khmer Empire. That Empire reached from the South China Sea almost all the way to the Bay of Bengal in the West. 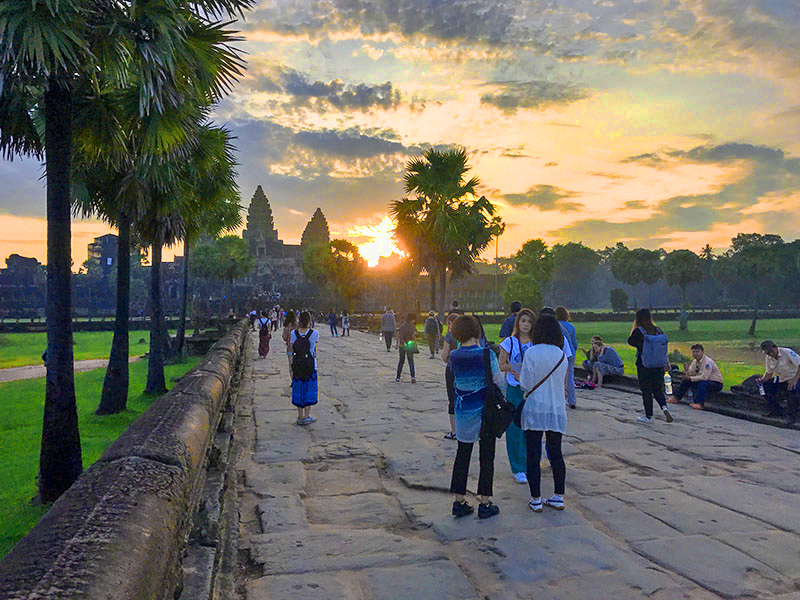 Angkor – the word means “city” in Khmer – encompasses a series of sites including Angkor Wat (“the city which is a temple”), Angkor Thom (“great city”), Ta Prohm (“Ancestor of Brahma”), and other areas. Although many of its wooden buildings decayed long ago, Angkor’s massive stone temples and other ruins, about 70 in total, still survive. All told, the magnificence of Angkor stretches about 77 mi.² (200 km²) through the jungle. 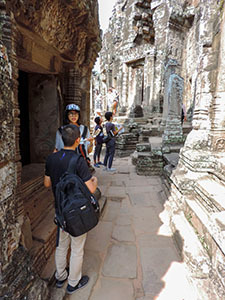 While you can get around Angkor with a good guidebook, you need a professional guide to understand things. If you want to see more than just the central area, you’ll also need a driver to get you about, since the distances can be formidable. 500 acres (200ha) in size, Angkor Wat is the largest religious complex in the world. Built by the Hindus in the 12th century, it is obviously of Hindu design. During the ensuing centuries, however, Buddhism replaced Hinduism throughout Cambodia, so you also see many images of Buddha. After the sun was up Sarevy and I wandered through the amazing complex, an incredible structure with intricate carvings and topped with five towers. Bas-reliefs cover the walls of the temple and the outer gallery surrounding the complex. I found beautiful and interesting views all over the area. The best views, naturally, were often on the second level of the temples and other buildings. And, naturally, the stairs were often steep and required stamina. But I was well rewarded at the top. 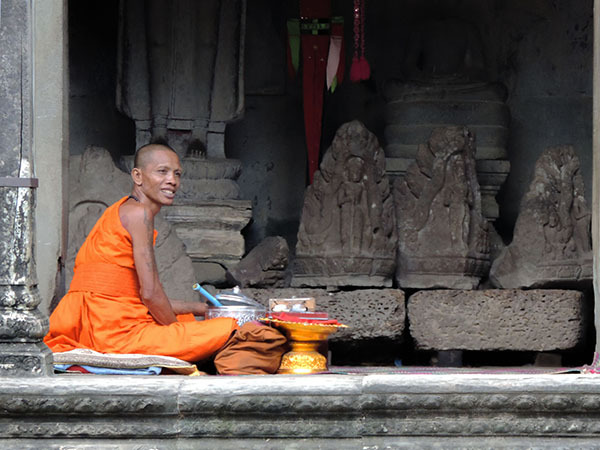 Sarevy told me there was a Buddhist shrine in the middle of the temple where one always found two monks. We walked over, and I watched as a woman went up to the orange-robed monk, and sat down with him. After a few words, he prayed for her, blessed her, and then tied a string bracelet on her wrist. A week earlier a monk in a temple in Thailand had similarly blessed me and also gave me a bracelet. The bracelet signified I was blessed, and to bring me good luck. Mine was white, however; at Angkor Wat, the woman’s was a bright orange, the color of the robes of the monks. I stayed for a fascinating few minutes, watching the blessings and listening to the chants. When I continued wandering around the complex, I found other visiting monks snapping away with their phones and iPads. We left Angkor Wat through its South Gate and walked to Angkor Thom, pausing at one point along the way. There Sarevy showed me a little exhibit demonstrating how workers cut the rock and put it together in the ancient construction. Angkor Thom, spread out over an area of four square miles (10 sq. km. 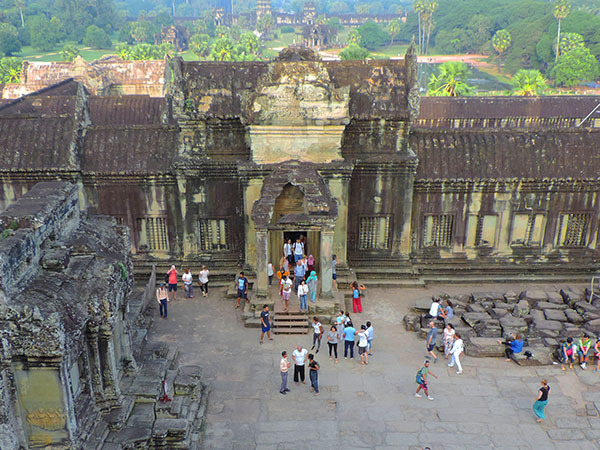 ), is much larger than Angkor Wat. The city has five gates, each topped with four massive stone faces. We approached Angkor Thom’s through its South Gate, the best preserved of the five. More than a hundred large stone faces, each a god with a different expression, lines the avenue to it. There are numerous ruins inside Angkor Thom, but the most famous is Bayon. 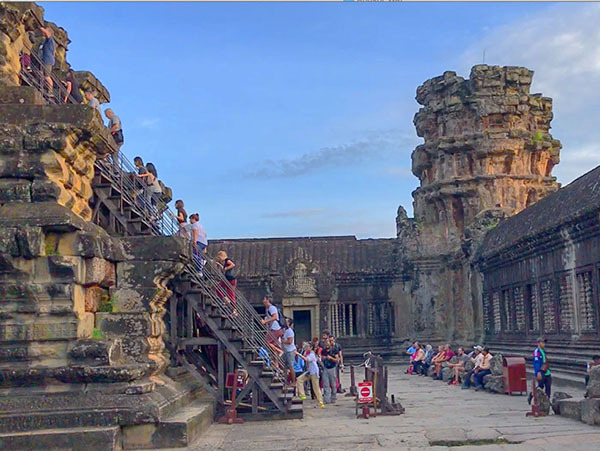 It’s an incredible temple that exemplifies the ancient civilization of Angkor. The huge temple has 54 towers – with 200+ large stone faces—and rises three levels. 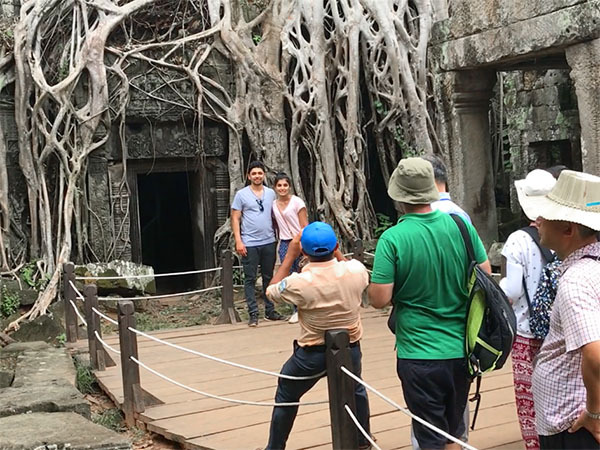 It had already been a long morning, and before lunch, we made a stop at Ta Prohm. 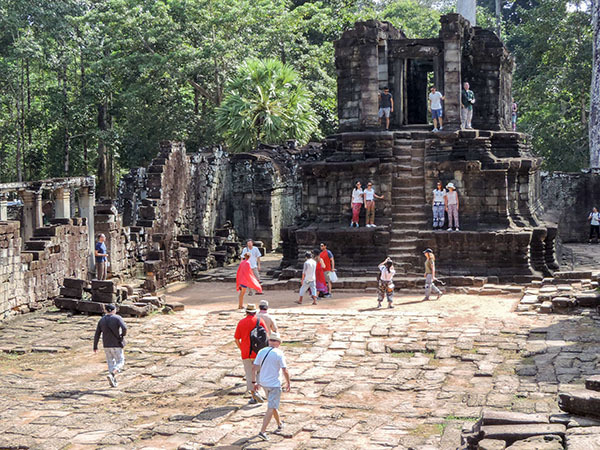 Considered one of the more mysterious temples in Angkor, it originally was a Buddhist monastery. The temple was discovered during the French Colonial Period and great care has been taken to leave the site pretty much as found. Although paths are cleared, you see the large roots of the strangler fig trees “strangling” buildings everywhere. In addition to the “Tomb Raider,” several other trees are also named, including the Crocodile and Waterfall Trees. After leaving Angkor Thom, we stopped at a restaurant, which offered both outdoor eating (under fans) or in the air-conditioned restaurant. It was a nice little place, clean with a very courteous staff and a relatively extensive menu. Opting for culinary safety, I ordered a salad with shredded chicken and pasta, along with a bottle of Angkor Beer. It turned out to be reasonably good, and while I was dining four other groups entered the restaurant. Obviously, this was the place many tour guides bring their clients to during a tour. Earlier, Sarevy had told me of Beng Melea (meaning “lotus pond”), another site also left unreconstructed after it was discovered. It was a more authentic site, he told me, since few tourists knew about it. Although it was a 1½-hour drive to the east, I wanted to go, and we set off immediately after lunch. 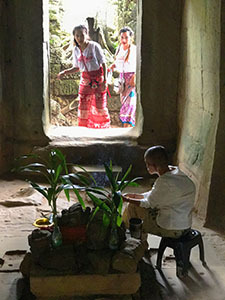 I greatly enjoyed the trip that provided glimpses of the real Cambodian countryside. Several villages intrigued me with their exceptional cleanliness and color. While the countryside was charming, I found Beng Melea fascinating. It was the real thing, indeed left in its natural state, more than Ta Prohm or the other sites. Instead of walking on cleared paths about the ruins, here an elevated boardwalk let you safely meander through the ruins. It was a wonderful way to see the site up-close while standing safely above the huge piles of moss-covered blocks. Aside from a few spots where a beam supported something for safety, there was no reconstruction in Beng Melea. It remains overrun by the jungle, exactly as it was when discovered by archaeologists. Thankfully, the government will continue to leave it in its current state, only maintaining it to prevent further deterioration. The view from the boardwalk was excellent. In front of us, giant roots of strangler figs reached out and grasped moss-covered building blocks. Through the dense jungle about me, I could hear the squawk of parrots, intermingling with the songs of other birds. Numerous butterflies fluttered about, flaunting their bright colors against the lush green foliage. It was a fascinating, standing in the jungle in the midst of an ancient city frozen in time. Another one of those experiences that makes travel so rewarding.